This recipe for tasty sugar cookies was taken off the back of a bag of Gold Medal Flour. You can roll or drop... I avoid rolling at all costs! ;-) In fact, the recipe is actually called, "To Roll or Not to Roll Sugar Cookies." "TO ROLL OR NOT TO ROLL SUGAR COOKIES"
FOR NO-ROLL COOKIES: In large bowl, beat sugar and butter on low speed or with spoon until light and fluffy. Stir in vanilla, almond extract, and egg. Stir in flour and baking soda. Shape dough by teaspoonfuls into balls. On ungreased cookie sheet, place 2 inches apart. Flatten with bottom of glass dipped in sugar. Bake 9 to 11 minutes or until set. Immediately remove from cookie sheet to cooling rack. FOR ROLLED CUTOUT COOKIES: Use 1 1/2 cups powdered sugar instead of 1 cup sugar. In large bowl, beat powdered sugar and butter on low speed or with spoon until light and fluffy. Stir in vanilla, almond extract, and egg. Stir in flour and baking soda. Cover and refrigerate at least 2 hours. Divide dough in half. Roll each half 1/4 inch thick on lightly floured surface. Cut into desired seasonal shapes with 2- to 2 1/2-inch cookie cutters. 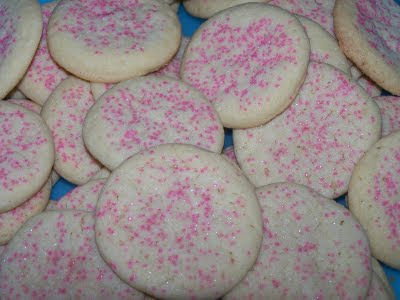 If cookies will not be frosted, sprinkle with sugar. On ungreased cookie sheet, place cutouts 2 inches apart. Bake 7 to 8 minutes or until edges are light brown. Immediately remove from cookie sheet to cooling rack. So, I assume that you didn't roll? Why bother if they look this good? I may have to add this to my cookie repertoire. I don't have a go-to sugar cookie yet. Thanks for the recipe! YUMMY! Sugar cookies and Snickerdoodles are my all-time favorite cookies. This recipe rocks! Looks so yummy. I would like to make it at Halloween. Thanks for such delicious recipe. Keep posing!